Okay, before we delve into the product line, let’s take a quick look at who the legend, Madam C.J. Walker was. She was born in 1867 in US and was an entrepreneur who went on to become the first self-made millionaire in USA. Her business involved hair care and beauty products for black women. She was also a philanthropist and an activist. She died in 1919 at the age of 51. You can find out more about her and her legacy HERE. Treatment scalp and strand nourishing collection. Lord, that was a mouthful! Two questions come to mind now – what’s in these products and does any part of it consist of Madam C.J. Walker’s original recipes or it will just be her name on it. 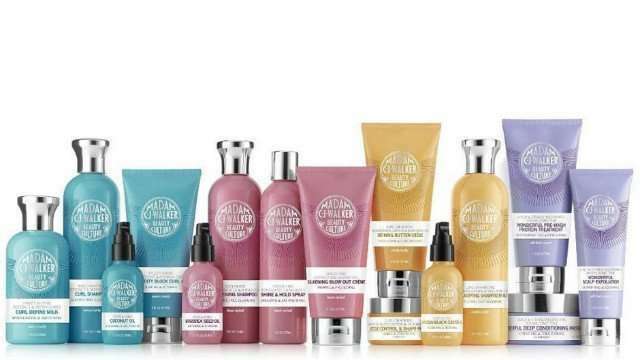 Since Sundial Brands is the company responsible for bringing us SheaMoisture & Nubian Heritage, I imagine the ingredient composition will be top notch and I’m pleased with what I’ve seen so far. For instance, the Coconut Oil & Moringa Oils Curl Milk contains water, cocos nucifera (coconut) oil, butyrospermum parkii (shea) butter, theobroma cacao (cocoa) seed butter, cetyl alcohol, stearyl alcohol, capric/caprylic triglycerides(coconut oil), glyceryl caprylate, glycerin (vegetable), behentrimonium chloride, dimethicone, fragrance (essential oil blend), moringa oleifera seed oil, simmondsia chinensis (jojoba) seed oil, panthenol, hydroxyethylcellulose, hydrolyzed vegetable protein pg-propyl silanetriol, aloe barbadensis leaf juice, coco glucoside, chitosan, polyquaternium-70, tocopheryl acetate, hydrolyzed keratin, algin, gellan gum, sodium benzoate, dipropylene glycol, glyceryl undecylenate. The Jamaican Black Castor & Murumuru Oils Ultra-Moisturizing Detangler contains water, glycerin (vegetable), dimethicone, glycerylstearate, cetyl alcohol, cetrimonium chloride, polyquaternium-7, helianthus annuus (sunflower) seed oil, glyceryl stearate citrate, cetearyl alcohol, butyrospermum parkii (shea) butter, ricinus communis (castor) seed oil, astrocaryum murumuru seed butter, panthenol, hydrolyzed collagen pg-propyl methylsilanediol, hydrolyzed vegetable protein pg-propyl silanetriol, urtica dioica leaf extract, althaea officinalis root extract, orbignya oleifera (babassu) seed oil, caprylhydroxamic acid, caprylyl glycol, caprylic/capric triglyceride (coconut oil), coco-glucoside, hydrolyzed keratin, algin, chitosan, gellan gum, glyceryl caprylate, fragrance (essential oil blend). According to Richelieu Dennis, the CEO of Sundail Brands, the product line brings two new beauty breakthroughs to the market. Dual-encapsulation oil technology (designed to infuse hair with two natural oils) and a natural silicone alternative (brassica seed oil). Additional natural oils in the products include Jamaican Black Castor Oil (JBCO), murumuru oil, coconut oil, moringa oil & shea oil. Yeah, I’m sold. Where can I get it? Initially, the products will be sold exclusively through Sephora. While I’m not feeling 2 to 3 of the ingredients listed above, they’re not enough to deter me from at least giving the products a try. Counting the days till they’re available at my local Sephora store.